Stanley Charles (Chas). Bunker was born 18 August 1903, North Fitzroy (Melbourne) to parents Charles Bunker (1864 – 1931) and Emma Bunker nee Woodward (1866 – 1950). In the mid 1880’s Charles and Emma left their home in Streatley, Bedfordshire, England and migrated to Maryborough Queensland where their daughter, Harriett, was born in January 1887. The family then moved south to Melbourne where Stanley Charles was born (1903) in North Fitzroy, an inner suburb of Melbourne. The Bunker’s later moved into the then small seaside town of Altona in around 1925 residing in Upton Street. Six years later on 8 December 1931 Stanley’s father, Charles Bunker, passed away in Newport, and Emma Bunker remained living in Upton Street with Stanley. By this stage Stanley had been running his own grocery business for approximately 5 years in Altona. During this period, Stanley, had shared in the struggles of the town and surmounted many obstacles. When Stanley Bunker opened his first store there were no more than 100 houses within Altona. In June 1934 he married Amy Dorothy Waddington in Altona and the couple set up home in Queen Street Altona. Amy was born in Mildura (January 1911) to parents William Percival Raymond Waddington and Jane Grey Waddington (nee Semmens). In Mildura Amy’s parents were vine growers. Her uncle, Mr Semmens, was shire secretary of Mildura, a post also occupied by his father before him. Amy had moved to Altona to teach at the Altona State School at a time when Mr. H. D. Willis was headmaster there. During these times of the Great Depression, Stanley had a difficult task in tiding over as he lost a good deal of money because of extending credit for groceries to people who were unable to pay. In the early days very few merchants would deliver goods to Altona and Stanley Bunker found it necessary to call, at Reid’s produce store in Newport for his merchandise. Very few streets were made in Altona at that time, and it was no easy task in wet weather to manoeuvre a car loaded with goods. Stanley and Amy had two sons, John Charles born about 1937 and Allen born about 1946. It was said that of the two boys John appeared to have inherited his mother’s aptitude for learning. He won the City of Williamstown scholarship for the Technical school, and upon leaving school became an electrician. By the 1950’s, from the business point of view, Stanley, with the keen support of his wife, Amy, had grown with the district and was soon occupying the largest, store with perhaps one exception in Pier Street, which was now the main shopping centre for Altona. A new shop adjoining Mr. Bunker’s premises in Pier St. was erected for him and he intends to utilise these premises in the conduct of his business by means of a central- interior doorway. Stocks held by Mr. Bunker at that time included hardware, radios, electrical goods, crockery and crystal. One of the finest range of radios outside the city could have been inspected at his Altona store, comprising all the best sets. 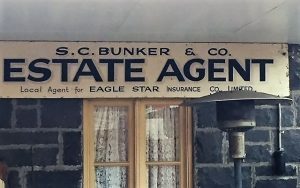 By way of, variety, Mr. Bunker has also introduced into his business activities an estate agency. The 1950’s was also a time when Stanley’s mother Emma passed away. Stanley later began to sell television sets at about £80 or £100 a set. He was quoted in a local newspaper, at the time that he “does not consider that television will do away with the existing type of radio set, as television programs will be presented for a limited time only. Moreover, the television sets will have to remain in the same place all the time, whilst the other types may be moved from place to place to suit the convenience of listeners.” If only he know then what we know now. While Stanley ran a very successful business, by way of diversion, he had also turned his attention to piano playing and was recognised as an accompanist of ability. He had also proved a proficient dance pianist. The Bunker’s continued to live in Altona until about 1963 when Stanley and Amy retired and moved to Gen Waverley to live. Stanley passed away on 28 March 1984 in Kilsyth, and Amy lived on until 16 June 1998, when she passed away at Ringwood.